ABB DSWs (Drives Service Workshop) are centers that focus on maintaining and testing ABB drives. They are located in dozens of cities worldwide. 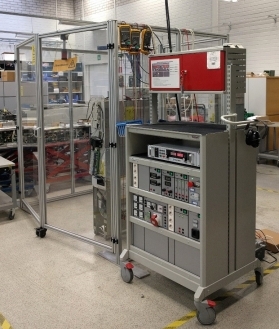 In the standard test routines, versatile AC and DC power supplies are needed to ensure correct operation of drives before sending the units back to ABB customers. TEKLAB MOBILELAB trolley was equipped with power supplies providing relatively high voltages from 0-1500 VDC and 0-690 VAC. These power supplies are used to ”wake up” the capacitors of the ABB drives and to test the operation using different input voltages to the drive. In addition, the trolley was equipped with variable DC power supplies for powering the control electronics of the drives. ABB Drives Service Oy has five test trolleys in use in Finland. In addition, DSWs in UAE, Saudi Arabia, Chile, Egypt and Russia use similar MOBILELAB test trolleys.